Back at the start of the year, I binge-read the first four books in Rix’s Translucent series. I loved them, and you can go to my blog and read reviews of them. It’s been several months since I was last in narrator Leona’s headspace, and would that hiatus break the momentum of the series for me? Or would the metaphorical distance have made the heart grow fonder? Well, let’s find out. Please note that I’ll do what I can to keep the review spoiler-free for this book, but I really do have to mention plot points from the previous four. First off, look at that stunning cover. I’ve enjoyed the consistency of the cover designs for this series, all clearly from the same photo shoot, but this one with the girl’s back arched as if she’s about to plummet backwards is such a striking image. Before reading a single word, it put me in a mindset to expect that Leona and her few remaining allies may fall before they prevail—and that’s exactly where the penultimate book in a gripping series should take me (consider who was lost in the penultimate Harry Potter book). Commendations to the design team for all the covers but particularly this one. The previous book ended with Leona, Emory, Captain Connor, and pilot Natasha on the shuttle heading to Tartarus, the dark and ashy planet orbiting a black hole on which Leona found herself alone in book three. It’s in the book description, so I’m not spoiling anything when I say that they find no signs of life there. That’s bad, as they believed that everyone not killed by the lampreys in book four had been sent through the dark-matter wormhole to Tartarus. But where is everybody? Then something bad happens—and I won’t tell what it is—and the ship is forced to make an emergency landing on the planet’s surface. Really tense stuff leads to the crash and continues through the crash, and this sequence is one of several strong passages in the book. Now on the barren Earth-replica surface, they head for their houses to get some rest before figuring things out. But what they wake up to? The book description calls it a “bizarre reality.” That’s an understatement that I won’t spoil with details. Let’s just say that the evil entity known as “Dark”—and your jaw will drop at the cliffhanger ending when Dark reveals its true name—can use the dark matter to manipulate reality. We’ve already seen it make people and objects invisible in book one, supposedly bring “Ashley” back from the dead in book two, render Leona intangible and transport her across the universe in book three, and create a doppleganger Leona in book four. But what Dark does here? I found each twist and turn jarring, and that’s a good thing since it made me feel like I was right there in The Twilight Zone wrapped inside The Outer Limits. So Leona and Emery (the boy who loves her but can’t fully get over the fact she killed his sister) have to manipulate the dark matter on their own, and as a science teacher, I applaud their experimental skills. I particularly like a new ability Leona learns: placing herself halfway between real space and the white space. I like how author Rix cleverly describes the phenomenon, and I really love how it’s used to tie into the theme of dealing with guilt. When I first learned about book one, the fourth book had yet to come out, so I thought I’d be reading a trilogy about a girl who uses the power of invisibility to cope with her guilt. Honestly, that’s what drew me to the story, particularly the plot element of invisibility. And I thought the voice she heard in her head when invisible was her guilty conscience, not an evil interdimensional entity. Would I have started the series if I knew then that it had six parts culminating with an epic intergalactic showdown between good and evil (light and “Dark”)? I’ll never know the answer to that question, but I’m so glad I did read these engrossing books. Actually, there’s a part of me wishing I could have waited until the final part came out so I could read them one right after another like I did with the first four. Especially after the final reveal here, which completely blew my mind. Even though I thoroughly enjoyed the book, I do have a few quibbles. Leona has a specific nervous tic that I noticed repeatedly but don’t remember from previous books, and it’s gnawing at my brain to determine its significance, if any. And I was thrown by a couple scenes that were much more graphic than anything in the books preceding it. But these are minor issues, and I’ve been invested so deeply in Leona’s story that this was a fun, mind-bending ride. Now I have to wait for the final book, but I have that Demon in Sight on my to-read list. Till then, Black Sun only blacks out half a sun for FOUR AND A HALF STARS. 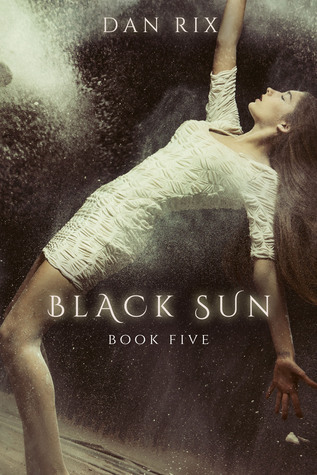 Sign into Goodreads to see if any of your friends have read Black Sun.